I've wanted to come up with a blog hop for a while now. I just think they are a fun way to meet people, especially when there are fun questions or the like. Problem was, every time I would think of something and google it, it seemed someone else already had the hop going. So I'd go back to the drawing board. Then yesterday, it hit me. What if I did a blog hop for people to share their favorite facebook status' from the week? I love seeing people's status'. I think it shares what people are going through right then: joy, funnies, heartache, etc. Wouldn't it be fun to have a blog hop where we could see those things from our bloggy friends? 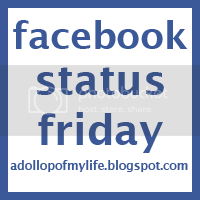 I think so, which is why I am giving "Facebook Status Friday" a go. So tomorrow, blog about your favorite facebook status from this past Sunday through Thursday (be sure to grab the button! ), come back here, link up, and share with the rest of the blog community a glimpse into your life. This should be fun!